There are few crossovers on the market that can compete with the value of the 2017 Honda CR-V in many ways, but especially the technology. Drivers everywhere appreciate the helpful tech that lets you pay better attention to the road while enjoying the audio entertainment offered inside of the cabin. Initiating automatically or letting you choose your favorite music to stream from your smartphone, you’ll love syncing your smartphone to this vehicle’s infotainment system. Read what you can expect to find in terms of technology below, then meet us for a test drive of this versatile crossover today! In reverse, you’ll be provided with a view of the vehicle from multiple angles so that you can maneuver into small parking spaces with ease. As long as you have your key fob on you, you’ll be able to unlock the doors and enter the SUV without pulling the keys out of your pocket. When the rain starts, so do these available advanced wipers that turn on automatically and adjust speed according to the rate of rainfall. Connecting your smartphone has never been easier or more seamless with the help of Honda’s streamlined app to hook up to a touchscreen display. Inside and out, the 2017 Honda CR-V carefully incorporates some of the most advanced automotive technology on the market. Starting with the touchscreen display mounted on the center console, you’ll be able to access an available Honda Satellite-Linked Navigation System for turn-by-turn directions as well as select apps from your smartphone to enjoy your favorite entertainment. Your sideview mirrors will feature visual indicators to let you know when a vehicle is approaching you on either side and that it isn’t a good time to switch lanes with the Blind Spot Information System. 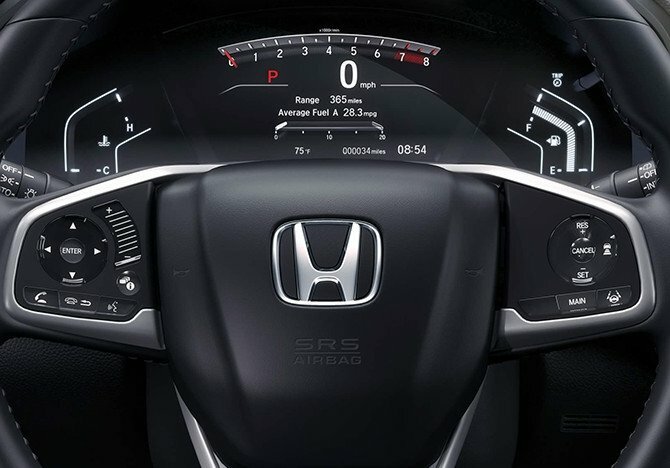 The Honda Sensing driver assistance technology package gives you the Lane Keeping Assist System, Adaptive Cruise Control, Collision Mitigation Braking System, and Road Departure Mitigation System for peace of mind as you drive in Inglewood and Santa Monica. You can test drive the new 2017 Honda CR-V when you visit us at 5850 West Centinela Ave in Los Angeles. To schedule a test drive, give us a call at (888) 381-0444, or contact us online if you have any questions about financing, features, or other services!